Life is beautiful, and I am in love with it. Today is my birthday. As I wake up and settle into this new day, I look back and realize, with deep gratitude, that I have been living every day like it’s my birthday. And why not?! You should do this as well, living life completely with a receptive heart, open and clear. Nurture yourself. Love yourself. Did you know that the simple words, thank you, will raise your vibration, for it is one of the purest prayers you could utter? Say, “thank you,” feeling the words reverberate within you. Thank you. I love you. What are you grateful for? This is an inspiring question and the mantra of Café Gratitude. Last night, on the eve of my birthday, Laura and I went to the Café Gratitude in Healdsburg to listen to raw chef Melissa Mango speak for the Monday Night Live series. Melissa, I might add, is a wonderful spirit. She is absolutely vibrant. 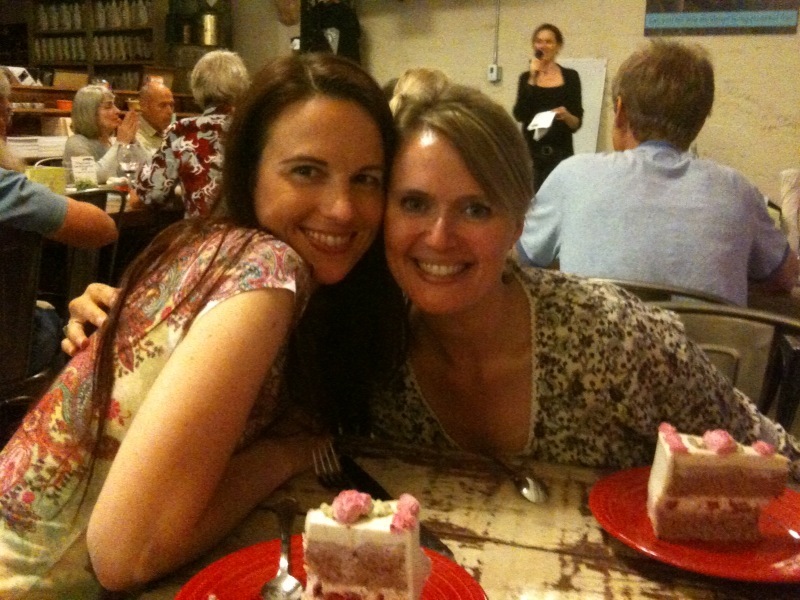 Laura and I had a fantastic time, and I love the photo above of us- two friends mingled with deliciousness. Thank you. I am grateful for the growing raw community in my area. It is such a blessing to walk into an establishment, as I did last night, and know so many sweet souls. We shared smiles, conversation and delicious foods. I sipped on an ‘I Am Succulent,’ a grapefruit apple celery mint juice, which was divine, sweet and refreshing. I dined on my favorite entree, ‘I Am Sensational,’ the pesto pizza with hemp seed basil pesto & olive tapenade- oh so good! And for dessert, the entire staff of Café Gratitude crowed around my table hopping around, dancing, and clapping while joyously singing, They Say it’s Your Birthday, by the Beatles. My cheeks blushed through big grins. The cake that was delivered, garnished with a single red lit candle, was amazing. It was a layered strawberry shortcake made of nut flour called ‘I Am Rapture.’ How appropriate; need I say more?! Thank you. As memorable as this evening was, the true blessing was gifted to me much earlier in the day. Laura hosted a Reiki class, and I joined her for it. I love Reiki. The energy flow is soothing and enlightening. Though I have been healing and attuning others with Reiki for many moons now, I am still caught in the wonderment of it. There is so much that cannot be seen that exists. Reiki energy is powerful, no doubt. It heals the body and sharpens the ethereal body and intuition. Every time I work with this energy, I feel spiritually empowered. I received a healing attunement for my birthday. Though my birthday presents have yet to roll in, I am certain that the attunement will dwarf all other tangible gifts. I felt intense energy all around me, hitting me in waves, rolling over and around me like a gentle warm ocean. I sank into a deep meditation, my ankle twitched, my third eye ignited. Thank you. The third eye, often referred to as the inner eye, is the portal that leads to inner realms and spaces of higher consciousness. Lately, during my meditations, I feel intense pressure in my forehead at my third eye. Yesterday, my forehead was on fire, intensely pulsating with the Reiki. I felt an energy shift as “something” left me. Reiki attunements amplify healing energies, clearing blocks and aligning the Self to higher purpose. Since the healing works energetically, it deeply nurtures the body as well as the soul. This treatment enveloped me, and I glowed for hours afterwards, basking in my heightened lightness. I am curious to see how I unfold as the days drift by. I wonder what blocks left me during this session, what energetic resistances were whisked away by the Reiki healing. I am blessed. I see this. I truly know this. Thank you. You, too, are deeply blessed. I want you to see and know this for yourself. Take the time to count your gifts, your blessings. What are you grateful for today? What treasures lie within your life that need to be picked up and polished, acknowledged and showcased? Smile for no reason. Enjoy the people around you with fresh eyes. Appreciate and earnestly love your Self. Give and receive without expectation. Open your heart. Live in abundance. Honor your truth and cherish your precious life.